This year we celebrate Mother's Day on 31st March. It is a celebration honouring the women in our lives that raised us, and is a great excuse to make them feel as loved and appreciated as they are. 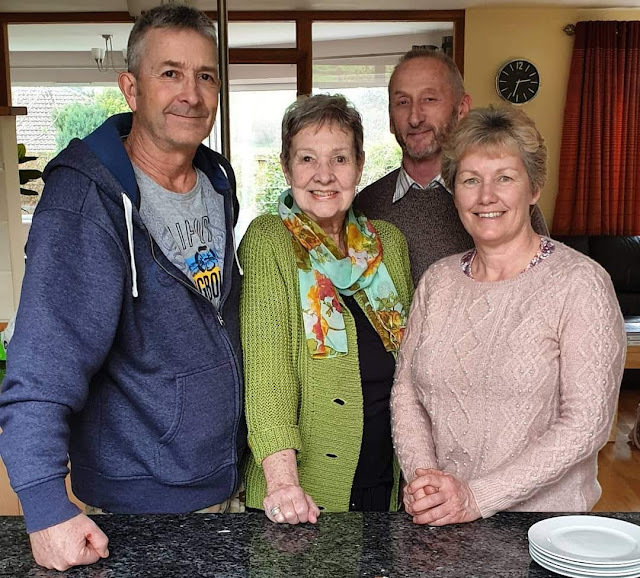 This year I wanted to treat my Mum to something a little different, and something that perhaps the whole family could get involved with. I originally planned on taking her out for an afternoon tea, but I thought that it would be that much more special if I put on the spread myself! 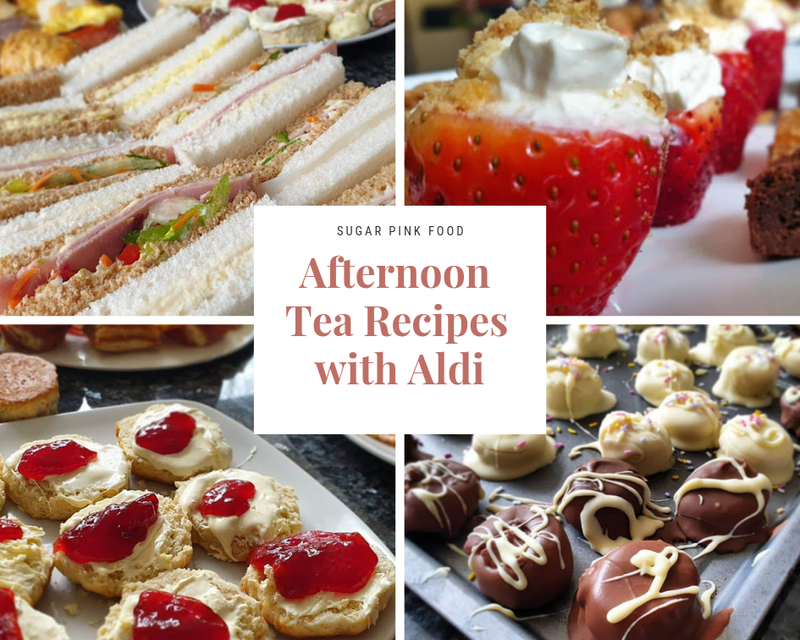 I teamed up with Aldi to create some delicious afternoon tea recipes that are perfect for Mother's Day, and also don't break the bank. 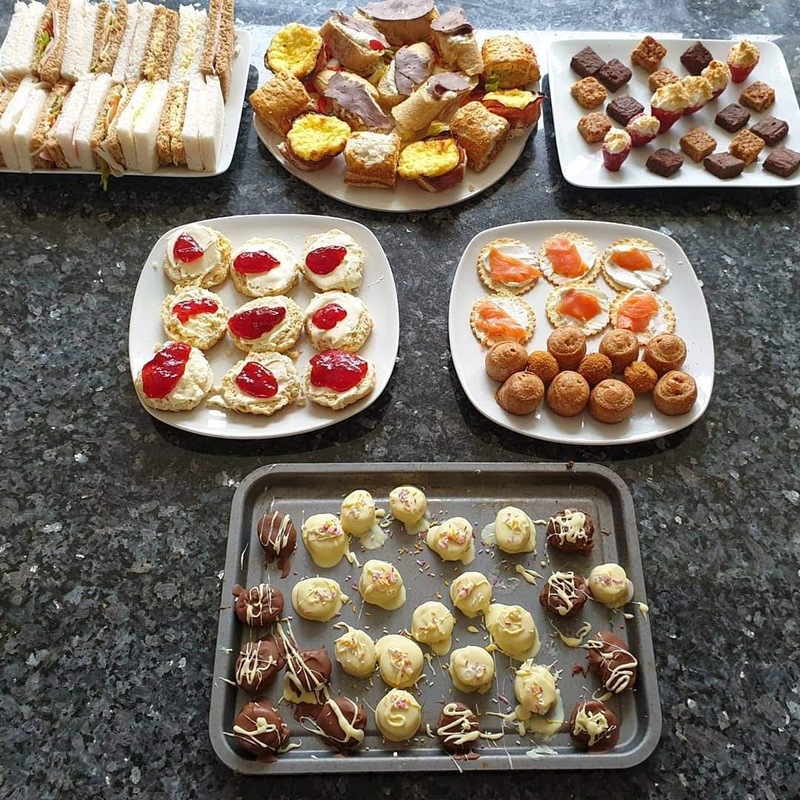 Thanks to Aldi's amazing range and low prices, I was able to put on this incredible spread for a fraction of the cost it would be to go to a proper afternoon tea out. The entire afternoon tea cost only £29, and was quite the spread! My Dad and my grandparents just had to get involved too, and we had a lovely family afternoon. 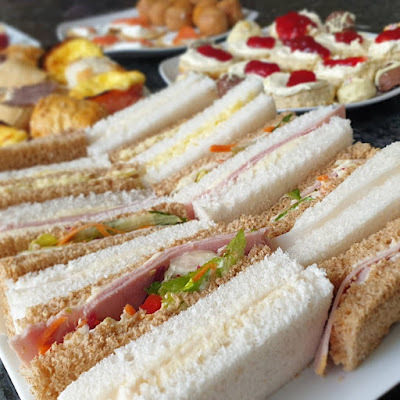 Scroll down to see some of the recipes I used to create this delicious afternoon tea! 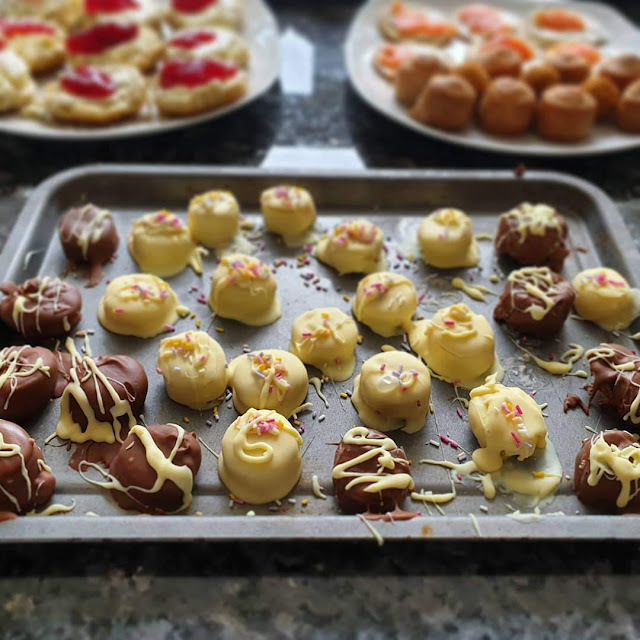 One of the recipes Aldi shared with me was their Banana truffles. They were decadent and totally delicious! Peel the bananas, trim the ends and cut each banana into 8 slices. Put them in a bowl and gently coat in the lemon juice. Arrange them on the baking tray and put into the freezer to freeze for 15 minutes. Break up the chocolate in a heatproof glass bowl. Put the bowl over a pan of simmering water, making sure the bottom of the bowl doesn’t touch the water. Allow the chocolate to melt, stirring gently as it does. When melted, take the pan off the heat. Keep the bowl on top of the hot water to keep the chocolate warm. Dip the frozen banana slices in the chocolate to coat them all over with chocolate. Put them back on the baking sheet and freeze again for 10 minutes. Sprinkle over the cocoa just before serving. These keep in the fridge for a few days, or serve them frozen straight from the freezer. Get this banana truffle recipe here. Use a teaspoon to scoop out the insides of each strawberry. Mix together the Quark, cream cheese, sweetener, vanilla extract and lemon juice and beat until smooth. Use the teaspoon to fill each strawberry, then sprinkle the tops with the crushed up digestive. You would not believe how simple it is to make these scones, and how delicious they taste! There are only 3 ingredients needed to make them, and every time I have made them they come out perfectly. The scones are one of the most important parts of of an afternoon tea, and I promise that these won't disappoint! Not only that, but the total cost of the ingredients to make 10 scones only costs £1.90, with loads of flour and lemonade left over! Preheat oven to 200C or 180C fan. Mix the flour, cream and lemonade in a bowl, but be careful not to over mix it. You are looking for a relatively soft and sticky consistency for the best scones. Flour the work top, then tip the mixture out on to the floured service. Pat the mix down to about 2cm thickness. Use a circular scone cutter to make the shapes. Remix any off cuts to get as many scones as you can out of one mix. 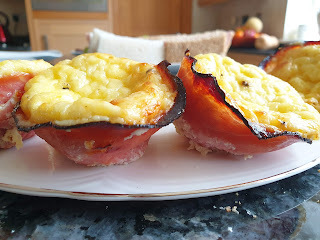 Place on a lined tray and bake for 12-15 minutes, or until they start to turn golden on top. I love to eat them while they're still warm, but they're just as delicious cooled. 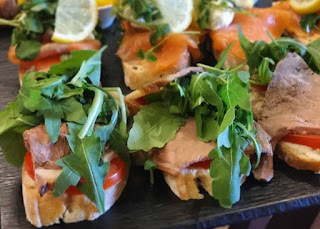 I love open topped sandwiches, and used Aldi's bake at home sour dough bread as the base. You can have any toppings you like, but one of my particular favourites is beef and horseradish sauce. Cooked beef slices are only 69p, a whole jar of horseradish is only 39p, and pre-made salads start at 79p. Just layer your chosen toppings on the freshly baked bread. I also did chicken with a smoked paprika mayo. Everyone loves a sandwich with their afternoon tea. I used a mixture of white and brown bread to create these cool sandwich patterns. My favourite fillings are cheese and pickle, ham and mustard and cheese with salad and mayo. The total cost of the sandwiched I made, including fillings, was £3.50! Spoon the quiche mixture into each ham case. Check out the Aldi recipe page for loads more great ideas.